This article is about a class of Kepler orbits. For a free body trajectory at constant gravity, see Ballistic trajectory. The green path in this image is an example of a parabolic trajectory. A parabolic trajectory is depicted in the bottom-left quadrant of this diagram, where the gravitational potential well of the central mass shows potential energy, and the kinetic energy of the parabolic trajectory is shown in red. The height of the kinetic energy decreases asymptotically toward zero as the speed decreases and distance increases according to Kepler's laws. In astrodynamics or celestial mechanics a parabolic trajectory is a Kepler orbit with the eccentricity equal to 1. When moving away from the source it is called an escape orbit, otherwise a capture orbit. It is also sometimes referred to as a C3 = 0 orbit (see Characteristic energy). Under standard assumptions a body traveling along an escape orbit will coast along a parabolic trajectory to infinity, with velocity relative to the central body tending to zero, and therefore will never return. 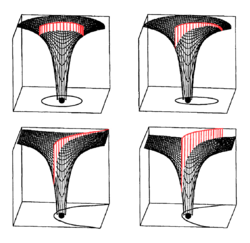 Parabolic trajectories are minimum-energy escape trajectories, separating positive-energy hyperbolic trajectories from negative-energy elliptic orbits. is the standard gravitational parameter. At any position the orbiting body has the escape velocity for that position. 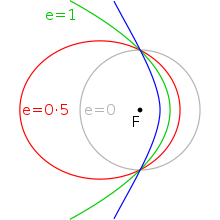 If the body has the escape velocity with respect to the Earth, this is not enough to escape the Solar System, so near the Earth the orbit resembles a parabola, but further away it bends into an elliptical orbit around the Sun. is orbital velocity of a body in circular orbit. Barker's equation relates the time of flight to the true anomaly of a parabolic trajectory. A radial parabolic trajectory is a non-periodic trajectory on a straight line where the relative velocity of the two objects is always the escape velocity. There are two cases: the bodies move away from each other or towards each other. corresponds to the extrapolated time of the fictitious starting or ending at the center of the central body. is 1.5 times the current speed, i.e. 1.5 times the local escape velocity. at the surface, apply a time shift; for the Earth (and any other spherically symmetric body with the same average density) as central body this time shift is 6 minutes and 20 seconds; seven of these periods later the height above the surface is three times the radius, etc.